Kids have a natural curiosity about the world around them. They like to question everything and want to explore everything. That is always a good thing for kids minds to grow. This helps them learn about things they see in day to day life and discover the world around them. Similarly, science apps for kids can also help them learn basics of nature and world around them. 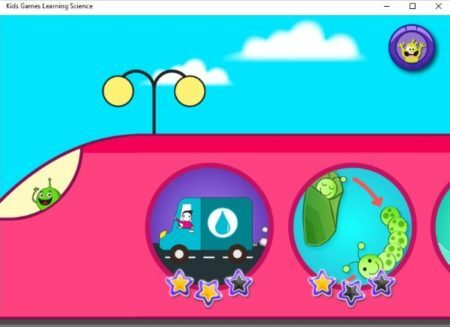 We are covering science apps for kids in this article, which will help kids learn more about the world around them in a fun, colorful way. The apps can teach kids basics like animals and their homes, sink and float, senses, etc. These help kids learn as well as enhance their skills of communication, memory, matching, identification, etc. 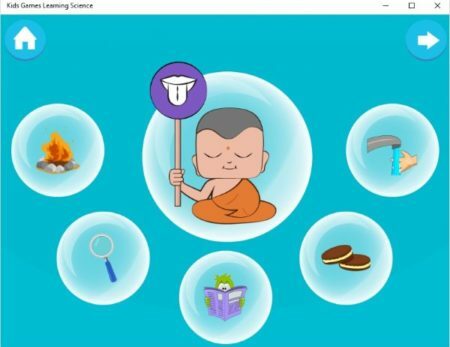 So lets go ahead and see the apps we found in Windows 10 store for kids to learn everyday science. All these games will teach you some concept or other about the world around you. When you start the app you will come across an interface like the one seen in the screenshot above. You can see the app is quite colorful and kid friendly. The homepage has a train on it with various games as windows on the train. You can scroll through the entire train and choose a game which you would like to play. Lets start with animals and their home. 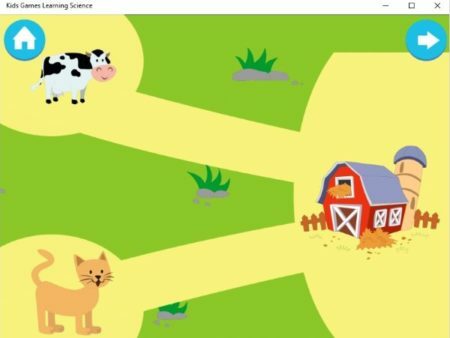 The screenshot above shows two animals and a house. Now kids have to choose which animal does that house belong to. If you give the correct answer you will be taken to your rewards page where you will earn a animal sticker for your achievement. The background sound and narration is also great. Another game is to know your senses and sense organs. The screenshot above shows the senses game. In this game the yogi in the center is holding a card with a body organ drawn on it. Around him are 5 things displayed in circles. Now out of these five you have to choose which sense is related to this body organ. Like in the above screenshot we see a mouth, so we know its related with tasting. Therefore the right answer is the cookies. Again in this game also you get rewards for giving the right answer. Apart from games there is a parents section at the top right of the screen, from where you can go and see statistics on how your kid is doing in which game. All the games in the app are easy and let kids learn a lot about natural world around them. Thus helping them develop identification skill, hand eye coordination, memory, etc. Science for Kids is a nice app for kids to learn science. When you start the app you will see a screen like the one in the screenshot above. The app is divided into four sections, science experiments, scientific careers, science songs, and science facts. Each of these sections is pretty interesting. The first sections is Science Experiments. 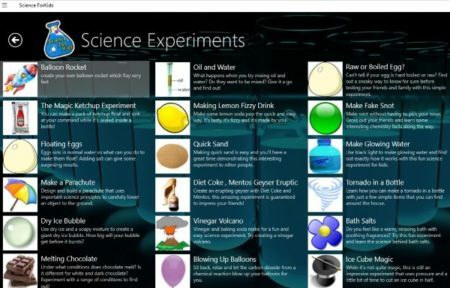 In this section you will see a huge list of science experiments that you can do at home with regular household things. These are small experiments which can teach a lot of things to kids. You can help your kids perform these experiments. When you click on an experiment it will open in full screen mode. The page will list things needed to perform this experiment, directions on how to do it, and an explanation for what is happening and why. There are simple experiments like generating static friction, making a egg float in water, making a vinegar volcano, making dry ice bubble, melting chocolate, etc. These experiments can be a lot of fun for kids and they can learn new things while doing these experiments. The next section is Scientific Careers. You can see a screenshot of this section above. 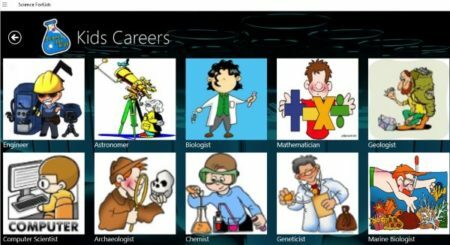 In this section the app lets you know what all careers paths or fields kids can choose in the field of science. Like they can become a biologist, marine biologist, geologist, engineer, astronomer, etc. When you click on each of these careers a page will open up defining what is this profession all about and what all that particular professional does. Next is Science Facts. In this section you will find some amazing facts listed, as can be seen in the above screenshot. 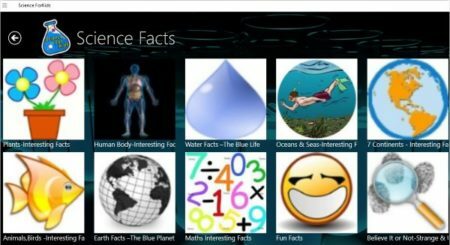 You can click on each listed tile and find some great science facts. The last section is Science Songs. 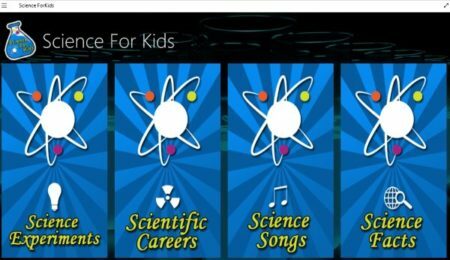 In this section you will find a lot of songs which have been made about science in some way or another. You can find songs like the motion song, the heat energy song, the sun song, etc. Songs can be a fun way for kids to remember many facts. These are the 2 apps I found in the app store to teach everyday science to kids. The apps are kid friendly and help them learn a lot of things about their surroundings in a easy, fun way. Check them out.